The Breakers, The Elms and Marble House fill with thousands of poinsettias, fresh flowers, evergreens, and wreaths. Thirty decorated Christmas trees reflecting individual room decor are also on display. In addition, Rosecliff opens December 2nd - January 1st. 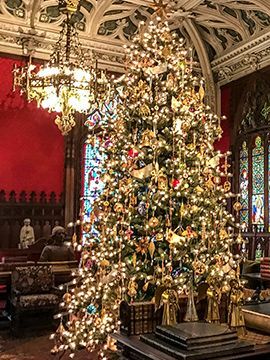 Highlights include the Newport Nutcracker, Holiday Evenings at the Newport Mansions and Santa Sundays.